Like modern dogs riding in autos, Rags somehow learned that it was fun to joyride on a street car or, even better, the longer-distance electric-powered trains operated by the Illinois Traction System. The ITS, usually called “the interurban,” offered passenger and freight service on 550 miles of track throughout central Illinois, from St. Louis to Springfield, Champaign, Danville, Bloomington-Normal and Peoria. Rags apparently began hopping trains sometime around 1906. ITS employees coddled him and fed him morsels of food, and Rags shortly became famous all along the interurban system. He was enough of a celebrity that newspapers sometimes took note of his visits. In January 1910, for instance, the Illinois State Journal’s Carlinville correspondent included the following in a wrapup of local news. Rags’ presence also was noted when a fire devastated the east side of the Auburn town square in 1910. “’The dog has been on a tour of the … line of late, part of the time with General Manager Chubbuck, and part of the time by himself, and his wanderings brought him to (Auburn) in time to see the ruins before the embers ceased to exist,’” the Journal reported. Bill Kemp of the McLean County Museum of History described Rags’ life of canine ease in a 2017 Bloomington Pantagraph story. (U)pon arriving at the city of his choice, Rags would promptly board a local trolley car. “While evidently no more than a common dog in every sense of the word,” commented The Pantagraph, “his intelligence has been recognized and he is watched by streetcar employees as a mother watches her child.” After a day or two riding the local “cars,” he would once more board the interurban and head to the next city, ready to do it all over again. Despite having no owner, Rags was always welcomed by motormen and conductors up and down the line. His was a hobo’s life of riding the rails, unencumbered by a master’s leash or a fenced-in lot. 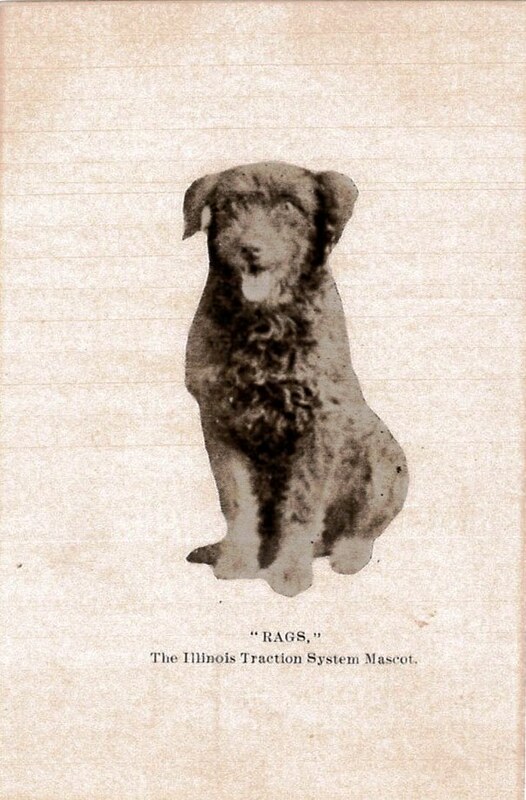 But the incident that made Rags’ fame red-hot took place when the dog was run over by an ITS train near Niantic, east of Springfield, in March 1909. The train’s conductor, Charles Johnson, saw the accident. He and the motorman moved Rags’ apparently lifeless body next to the tracks, and Johnson reported the accident to the ITS’s Niantic dispatcher. When a search party went back to look for Rags, however, the dog was gone. He was found a day later at a nearby farmhouse – minus his right hind foot, but alive. Another train hauled Rags to the office of the ITS’s Springfield superintendent, Bert Arnold, and pandemonium erupted up and down the interurban line. A varied lot of caller visited and extended sympathy to “Rags” yesterday. There were street railway men, interurban employees, newspaper men, visitors in the city who had heard of the dog’s virtues, white men, black men, boys and a few women. One small street Arab with a bundle of newspapers and a dirty nose knocked at the door of Superintendent Arnold’s office and, when a clerk opened the door, he stated: “Pleathe, sir. I wanths to sthee my frien’ ‘Ragths.’” The youngster was shown into the office and allowed to stroke the head of the suffering dog. “Rags” responded by a friendly caress with his tongue and his young friend hurried out to make room for others. Rags was taken to Dr. O.A. Seago’s veterinary office, where he was to be fitted with a rubber foot at ITS expense. The line also ordered a collar for Rags, “the best that can be bought,” to be adorned by a silver nameplate giving Rags carte blanche on any interurban train. With the loss of his foot likely to hamper Rags’ ability to hop onto moving trains, motormen were told to stop the cars to let Rags get on and off. A week after the accident, Rags was reported to be on the mend, but anxious to get back on the rails. “Whenever ‘Rags’ hears a street car bell ring he becomes impatient and has several times tried to escape from the hospital where he is being treated,” the Register said. Meanwhile, the story added, newsstands at ITS stations were doing a brisk business in life-size – 12- by 18-inch — photos of Rags. Heretofore “Rags” has been pictured only on post cards like members of the “Billy” Sunday party, President Taft and Easter Rabbits, but now the handsome large photographs of the celebrated canine taken in the prime of life, are to be had by those who believe in dog intelligence and dog faithfulness. The proprietor of the interurban news bureau states that several hundred of the pictures have already been sold. Rags seems to have coped well after the loss of his foot – the Carlinville visit, the Auburn fire and the Springfield dog show all took place after the accident. So did a fight with a bulldog in Decatur in which the indomitable Rags lost his left ear. According to the Pantagraph’s 2017 retrospective, Rags’ last appearance in Bloomington was in August 1912. That also seems to be the last report of any sighting of Rags. When and where he died is unknown. This entry was posted in Animals, Transportation. Bookmark the permalink. What a wonderful article! I wish I had met Rags, but failing that, this article makes me feel like I know him.